Looking To The Future, Libya Erases Part Of Its Past Moammar Gadhafi dominated the country for decades, and replacing his idiosyncratic rule is still a work in progress. It involves everything from removing exhibits at the national museum to revamping the way the oil industry is run. Libya's deputy oil minister, Omar Shakmak, says he secretly supported the opposition in Libya while working in the oil industry for decades. 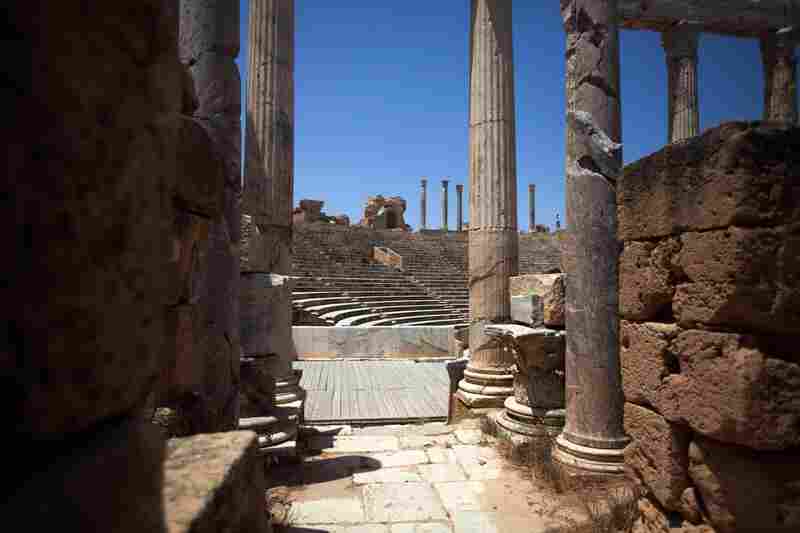 A view of the Leptis Magna amphitheater. Leptis Magna is a massive Roman ruin on the Libyan coast between Tripoli and Misrata. A display in Libya's national museum used to read "The Museums of the Jamahiriya." Jamihiriya was a word Ghaddfi invented to describe the governing system of Libya. The word has been covered with stickers of the revolutionary flag. An oil tanker sits off the coast of Al-Sidra, filling its tanks with oil from an undersea pipeline. Oil production crashed during last year's fighting, but is now approaching pre-revolutionary levels. A map of the oil pipelines at Al-Sidrah. The man pointing to the map is Abujala Zenati, who had retired as manager of the operation. He says he returned to work after the revolution to help support the new Libya. Abujala Zenati in the central control room at the oil production facility at Al-Sidrah. NPR Morning Edition host Steve Inskeep is taking a Revolutionary Road Trip across North Africa to see how the countries that staged revolutions last year are remaking themselves. Steve and his team are traveling some 2,000 miles from Tunisia's ancient city of Carthage, across the deserts of Libya and on to Egypt's megacity of Cairo. In his first story from Libya, he looks at what has changed in a country that was dominated for decades by one man. I was talking the other night with one of NPR's employees along our route – an Egyptian woman who has covered the Arab Spring as a journalist, and lived it as a citizen – and she mentioned how she loved George Orwell's 1984. Of course she did: Orwell was the master at describing the totalitarian state, and she had grown up under one of the Arab world's thuggish dictatorships. Orwell came to mind for me as we traveled through Libya, because it was Orwell who said, "He who controls the present, controls the past. He who controls the past, controls the future." For forty-two years, Moammar Gadhafi controlled the present, rewrote the past to suit his ends, and seemed likely to hold on into the interminable future. Now Gadhafi is gone, killed by rebels in his home city last October, and Libyans are still finding fresh and original ways to display the bloody images of his final moments on Facebook. His death finally released Gadhafi's grip on Libya's recent history, and his people are just beginning to revise the record. Once we rolled into Libya past a string of checkpoints and settled into a Tripoli hotel, we visited Libya's national museum. The building itself is a museum piece, a stone-walled castle that was standing in the early nineteenth century, when the infant U.S. Navy battled the so-called Barbary pirates based in Tripoli. The collection on display inside includes spectactular statues and carvings from the ancient Roman empire. And until recently, it also included a Volkswagen Beetle that belonged to Gadhafi. That car is in storage now, along with several rooms' worth of documents and artifacts linked to him. 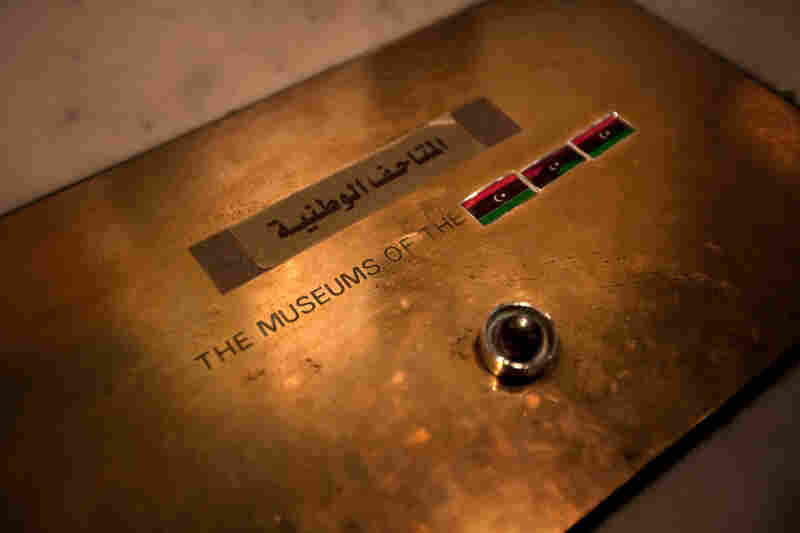 A museum employee, Najat Ben Hamida, showed us where artifacts glorifying Gadhafi's 42-year rule used to occupy much of the fourth floor. Now the floor is bare, and the document display cases are empty. "Everything here belonged to Gadhafi," she says. All kinds of documents, she adds, though she acts like she never paid much attention to them. Elsewhere, the museum staff has done the equivalent of repairing Libyan history with duct tape. Workers have put Libyan flag stickers over displays that give Gadhafi's personal name for Libya — the Great Socialist People's Libyan Arab Jamahurriya -– a made-up Arabic word. More permanent changes to Libya's history will take time. But many Libyans are now telling their own personal histories of the last few decades. We heard one such story just down the street from the museum, when we sat down with a man named Omar El Shakmak. "I was hiding for the last 30 years my activity in the Libyan National Front. 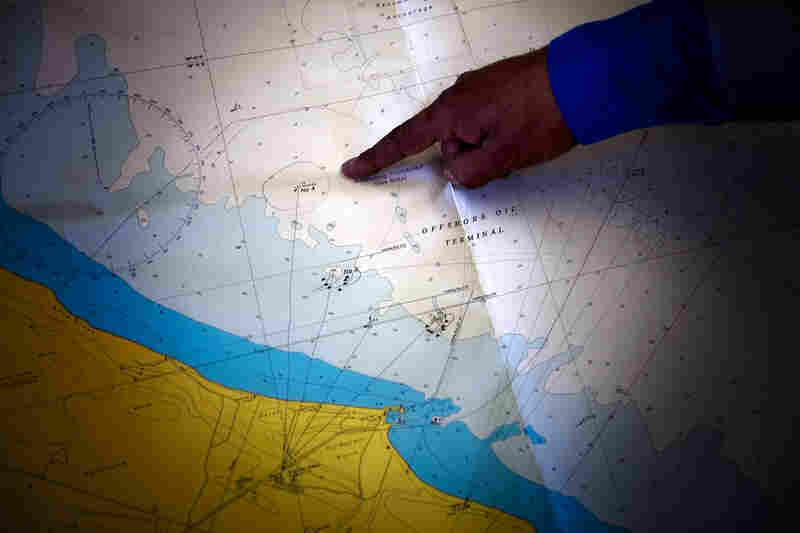 The opposition Libyan National Front," he says. Over tiny cups of espresso, he told us a story he could never have revealed just a year or two ago when Gadhafi was still in power. We were sitting in a hotel, by a window with a view of ships in Tripoli's harbor, and Shakmak shook off his blue blazer as we talked. He told us how he joined the state-owned oil industry in 1977, working as an accountant at an ammonia plant. 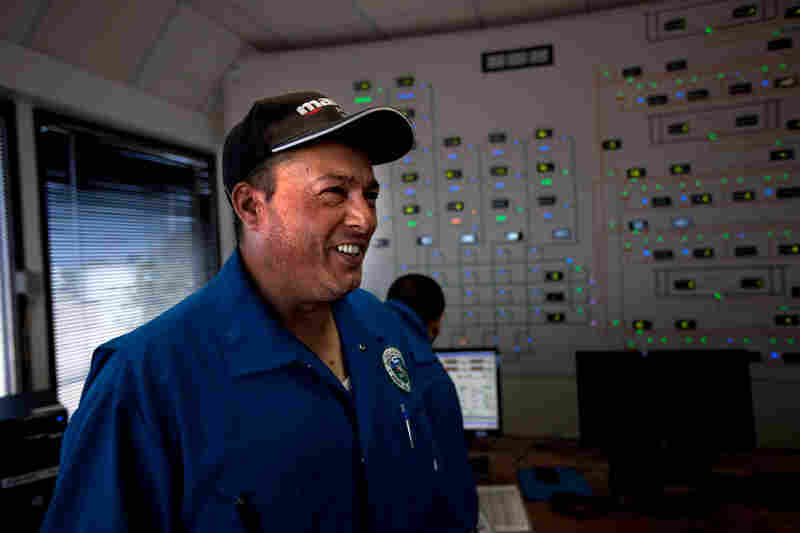 He worked for two decades at an oil refinery, hours from any major city. He eventually became an official in the oil company, and he often couldn't believe how the regime spent billions of dollars he and other workers were helping to make. "For example, when you hear about money being paid to some other government in Africa, and you knew that there is no added value at all to the Libyan people," he said. It left him very frustrated and helps explain why Shakmak joined the Libyan National Front, that opposition group, even as he continued working for the oil firm. When traveling abroad, he passed on information about Gadhafi's government. But in 1985, he was arrested by Libyan authorities. We ask if he was tortured, and he said he was. He then stands and leads the way to more private spot. He sits against a wall, tucking his arms beneath his raised knees and holds his hands together. "They put your hand like this, and then they tied it, and then automatically they pull you, and pulling you by a chain the other way, they hang you upside down," he says. A colleague at work, who knew nothing of his underground activity, spoke up for him, and swore he was loyal to Gadhafi. Shakmak was then released in 1986. But the Libyan National Front knew he couldn't risk working with them. The opposition group told him instead to simply stay inside the oil company and continue with his official job, because someday the opposition would need people with experience to run that industry. "People who are clean, who are not involved with corruption, qualified and efficient persons," he says. It seems extraordinary, but Shakmak insists it was true. Twenty-five years before the revolution that ousted Gadhafi, the opposition was preparing for it. The moment finally came last year. Two of Shakmak's sons were involved in the revolution. One was imprisoned by Gadhafi's government in Tripoli. The other joined a rebel fighting force that moved into Tripoli when Gadhafi's forces fled. The two sons were reunited at the bombed-out ruins of Gadhafi's compound. And today, Shakmak is the deputy oil minister in Libya's new government. 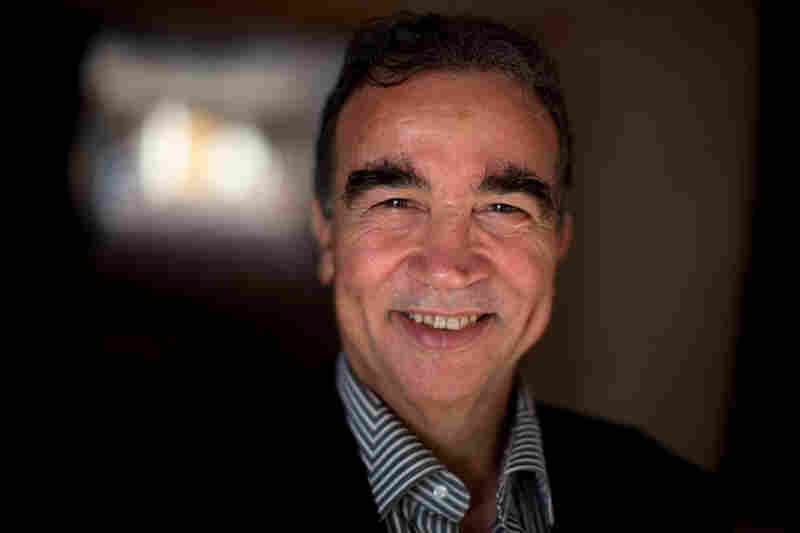 He has helped oversee the rapid revival Libya's oil industry, which is now back up to 90 percent of its pre-war production. The deputy minister arranged for us to see the oil terminal at the port of Sidra, in what was a Libyan war zone. The building manager, Abujala Zenati, climbed the stairs to a room with a view of the Mediterranean. 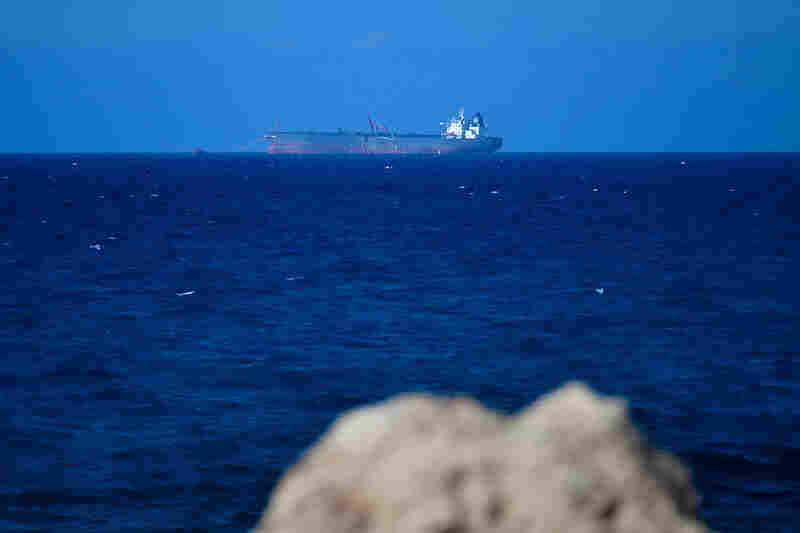 A few miles out at sea, two massive oil tankers were at anchor, sucking in Libyan oil from undersea pipes. The building was wrecked during the war, but workers laid new pipes and bypassed destroyed equipment. Walking across the grounds, you can smell the money Libya is making -– more than 300,000 barrels worth of oil from this port alone each day. Zenati explains the strong smell of crude oil. "Well actually, we have a little bit of a leak over there," he says. In his building, walls have been patched where they were punctured by shells. A few signs of combat remain in the walls of Zenati's office — like a bullet hole in the organization chart. But Libyan oil is once again flowing, earning the income that gives many Libyans confidence that for all their trouble, they do have a shot at a better future.